06.12.18 A long wild 12 days! Moving, Yard Sale, Furniture, Dora is lonely….. but not for long!!! Tuesday, June 12, 2018 – I started writing this on June 1st but have been so busy I didn’t publish it. It’s gotten fairly long since I keep adding updates. We’re in final count down mode toward moving out of Dora and I have to admit I’m a bit sad. We love our Dora and all of the years of adventures, happy times, and memories made. Getting to see every one of the 48 contiguous states and so many of the beautiful landscapes in our country has been something I never thought we’d get to do. God has been so good to us and allowed so much joy living on the road in our motor home. We knew from the first time we entered Dora that she was the one for us. Madisyn confirmed it was the one by saying she loved the shower!!! That was her job when we were shopping, letting us know if she liked the shower!! She was four then and is nine now. I asked her when I was writing this if she remembered that and she did. She did good! Everything we liked about other motor homes we saw was included in Dora. We have been so comfortable living in her and truly thought we probably would live in her until one of us died. Now that we’ve decided to move we are so happy and at peace with the decision, yet will miss our Dora. I really hope she gets rented often so we can keep her and still take a trip or two each year. We’ve already had several inquiries, so we’ll see. We don’t have a bed for the house yet so we may be sleeping in Dora until we get one. We’re in the country with no other house around our house so taking the short walk to the house and back won’t be a problem. We checked out purchasing a queen size air mattress if we don’t find a bed soon. Tomorrow, Saturday is the city wide yard sale in Ponchatoula. We’ll be starting out when they all open at 8 am, looking for anything and everything we’ll need for our house. What an adventure this is turning out to be. Wow, since I originally wrote this and forgot to publish it so much has happened. About renting Dora: One couple booked her for 17 days, a second is getting ready to book her after visiting us and Dora tomorrow. Just had an inquiry from a young man who wants to rent here right in between the first too. 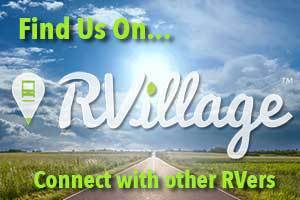 We are so thankful to Curtis Coleman, founder of RVillage, for sharing what he knew about how we could rent out our motor home. At the Ponchatoula city wide yard sale we purchased a large area rug for the living room, floor mats for the kitchen, a microwave/convection oven which we think is just like the one in our motor home so we can replace the older one with this newer prettier one! Here’s Roy on our lawnmower moving the oven from the truck to the storage building. It weighs a ton so he put his brain to good use and figured this one out. Somewhere in the middle of us moving out of the motor home and into the house, Chip’s family came and gave us a lot of help including giving us some of their furniture that they recently replaced with new furniture. Chip also cooked an amazing pot of crawfish corn soup which we all enjoyed while they were here and after they left! Misty and Madisyn helped me and Chip helped his dad with heavy things and making two trips here and back to his house to pick up more furniture. Misty gave us some wall decorations that will eventually make their way to just the right spot! I wrote this paragraph on Facebook Tuesday so I copied it and pasted this here. We are a little settled in the house, still a lot to put away. It is truly amazing how much stuff we had in the motor home hidden in the storage compartments below and inside in the cabinets, drawers and under the bed! We kept canned vegetables in three places and when all put together we had 13 cans of green beans and almost as many of several other vegetables! Didn’t realize we had so much because it was stored all over! We’ve now shifted our focus to getting the motor home ready for rental. Roy scrubbed the roof Tuesday morning and I cleaned and polished all the wood, etc. in the bedroom. All the bedding is clean and put back on the bed. I started cleaning the refrigerator and just pooped out so I’m taking a resting break in the house. It’s so nice and cool in here, we’re loving it! We both slept all night last night without waking up once. Old folks always wake up once or twice during the night but we didn’t last night! I’m sleeping on a full size air mattress and Roy slept on the sofa. Roy’s got his computer room all set up. We got a laundry hamper (haven’t needed one of those for five years), couple of trash cans (didn’t need those in the motor home), a storage unit for his computer room (built in drawers in the motor home took care of that before now!) and some other things we needed. I hope we can sit back soon and enjoy the new house. The view of the pond from the house is so beautiful, I’ll have to share some pics of that next time. A 75 inch long wood cabinet for the television to sit on. It’s got lots of storage space too! A king size bed frame, box springs and mattress. We also bought a mattress pad and really pretty teal bed linens. I slept like baby last night! I’m using the comforter from our oldest son’s bed when he was a teenager. Looking for a king size bedspread now. Chip loaned us his truck, again, so we could bring the furniture home. The new television is so awesome, we are really enjoying it and love the wood cabinet it is on. The wood cabinet matches the color of our kitchen cabinets. We cleaned out the motor home most of Thursday and Madisyn helped with that too! We still have more cleaning that we want to do but the Dish Network technicians are in Dora changing out some of our satellite equipment for newer equipment Roy spent at last two hours on the phone with Dish trying to get them to do what we need and finally they got it. That’s a subject for a blog post when Roy feels like writing it. They are here working right now so I’m forced to go back to the house and crash on the sofa. We have so much we want to get accomplished, but our mind wants us to do way more than our bodies can handle! A very nice couple from not too far away came to see Dora yesterday about renting her. We’ve talked on the phone with them first and enjoyed our visit with them yesterday. They just made her booking official! Sunday, the couple that booked her to rent first is coming to see her in person and meet us. We are looking forward to meeting them! This rental thing is going so well we may change our thoughts on selling her for now. It’s now Saturday. While all of this is good, it’s so stressful and we’re both feeling very worn out and punk today. It’s difficult to rest when you know there is so much that needs to be done. When we moved from Dora to the house, things just got put somewhere, not necessarily where they belong. I’m trying to tackle one or more areas each day until we feel settled. Our closet is now in much better shape than it was yesterday. We have two bathrooms now so figuring out what needs to go in which medicine cabinet and under the sink took a while. We have these beautiful medicine cabinets in both bathrooms and they are now both full! There are no shower curtains in either bath. I haven’t found the right ones yet but that will come soon! One of my favorite things about the house is this Fleur de Lis in the stained concrete inside the front door! I’m going to take a nap now and try to recover from feeling lousy! Today is Tuesday, June 12th. On Sunday afternoon we met with the first couple that booked her and the husband got to drive her around this area. The smile on his face told us he loved it! Monday we got our third two week reservation, booked and paid for! That couple is coming Saturday for their walk through and test drive. Other than a few days next week and a couple of days between the bookings Dora is now booked until after school starts again here in Louisiana. We did some shopping for additional things to provide for the renters in the kitchen, and new pillows for the beds and a bath mat. We also bought for our house’s guest bathroom a bathroom shower curtain, liner, decorative hooks, bath towels, hand towels, wash clothes, bath mats bath mat. We’re making small steps towards making our house look like a home. I just finished cleaning out the storage bins underneath the motor home. Roy purchased a new stereo receiver for the motor home and is busy doing whatever it is that he does to make it all work together just like he wants it to. < 06.09.18 Who Is Jesus To You?